Root Institute is an oasis of peace and tranquility, like a Pure Land within the environmental chaos of Bodhgaya. 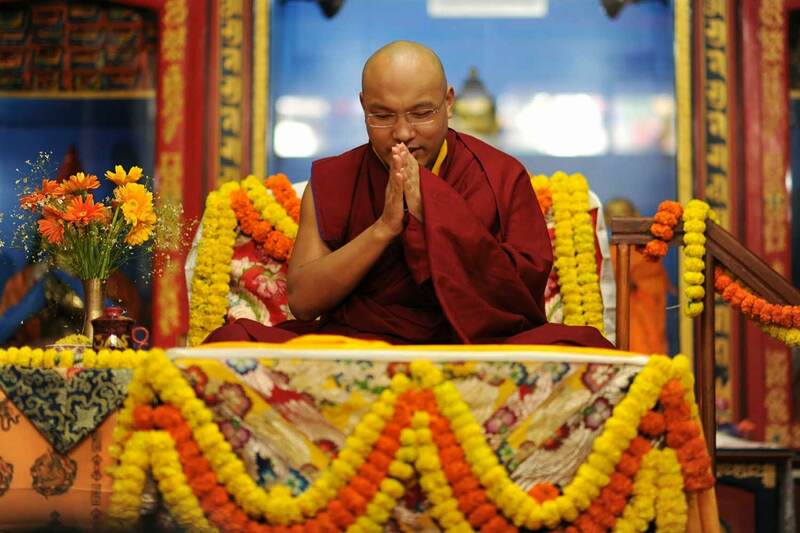 HH Karmapa’s teaching after the Monlam at the Institute, established by Lama Zopa Rinpoche, has become an annual tradition, a special event eagerly awaited by his Western students. When His Holiness enters the cosy shrine room it feels like the Buddha has come home to his sitting room, in marked contrast to the vast space of the Monlam Pavilion which seats 10,000. To create the right atmosphere, the Venerable Ani Sarah read Lama Zopa’s translation of Guru Rinpoche’s teaching on the benefits of making offerings to the Bodhgaya stupa, (and all stupas), a lengthy poetic treatise covering every possible object of offering and its incalculable benefits. With this preparation, HH Karmapa enters and offers a katag to the life-like photo of HH Dalai Lama resting on the throne. His own throne is garlanded in brilliant orange and gold marigolds. HIs Holiness expresses his pleasure at meeting Venerable Zopa Rinpoche at Root Institute for the first time since Rinpoche had manifested signs of stroke. 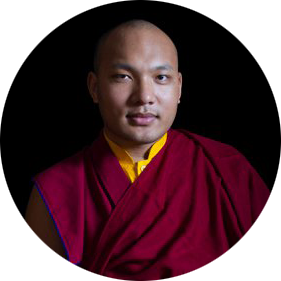 The Gyalwang Karmapa extends warm greetings to staff and sangha and a deep admiration for the wonderful work of Root Institute encompassing the noble vision of Zopa Rinpoche. ”I express my heartfelt appreciation and rejoice in particular in the area of Bodhgaya. There’s a lot of wonderful projects going on”. “I don’t have the ability to articulate the dharma or the experience of it. It’s not a matter of putting on a good show with body and speech. It’s mixing the dharma with one’s mind, taming one’s hardened mind, and diminishing mental afflictions. We may appear to be a dharma person, but faced with adverse circumstances, it turns into another story. We can’t leave the dharma outside our everyday life. Its purpose is to diminish our afflictions. Under ideal circumstances, one can feel one is developing, but faced with adversity, our practice doesn’t always hold. We have to apply an antidote on a consistent basis. “We entertain our mental afflictions. Once we feed them they strengthen out of the feedback we give them. Leave them alone and let go. Then they will weaken. Letting go will make them more and more powerless. “Mahamudra texts say one must not pursue mental afflictions, but when they arise, one shouldn’t worry about it. For example, someone on a journey will see various scenery. One doesn’t have to stop seeing what one sees, nor does one have to be alarmed. The journey must go on. We tend to claim ownership of what is on the path. Rather it is a journey of noticing mental afflictions, looking at their essential nature. Then mental afflictions will become powerless because they are not automatically equipped with the power to overwhelm us. By feeding them, mental afflictions gain strength. Whatever is concocted like lies, must come to the surface. If one doesn’t entertain it, the mental afflictions will be defeated by themselves. We have to confront the afflictions with all means and methods and if we can weaken their power we can tame and even uproot them. All dharmas come to the same point. All the profound instructions aim to uproot our mental afflictions. It is important to understand this. “Our mental disease is an old disease that has been with us from beginning-less time. It’s difficult to rely on a doctor because the doctor cannot cure it completely. Sometimes we consider the Buddha to be a doctor who gives us the medicine. But if we don’t eat it or use it properly, good medicine is not enough. We are the patient. We need to take responsibility. Sometimes we feel very spiritual and think ‘ I must get some degree of realization, or spiritual power’; but in real life, things change. In real life situations, we become another person. That kind of dharma practice is not very useful. We must have the spiritual power to face emotions and obstacles. This is what makes a dharma practitioner, or authentic practitioner. Sometimes we need to use different kinds of methods. All kinds of methods were used by great masters in the past. These provide inspiration to understand how to control the emotions. But we really need to find a personal method, not just follow the methods of great masters in the past. 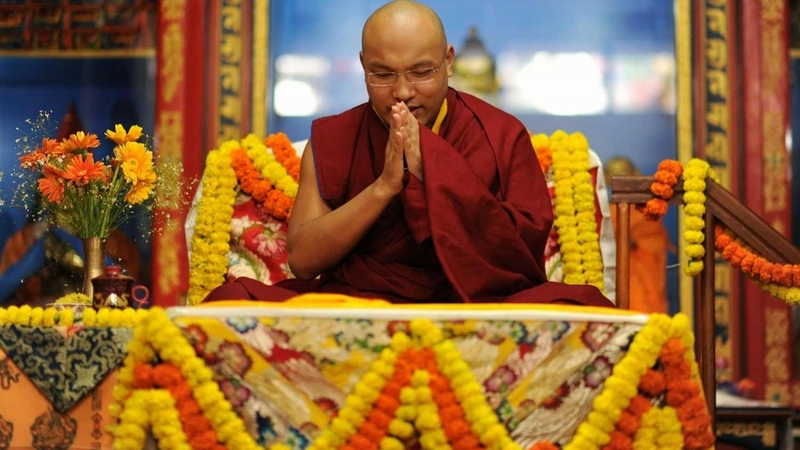 The Karmapa’s talk began in Tibetan, jumped seamlessly into English, then returned to Tibetan. As it ended, His Holiness left the shrine room holding hands with Lama Zopa Rinpoche. Starting with an initial reluctance to teach mahamudra, the Karmapa’s talk turned into spontaneous mahamudra, brilliantly encapsulating the essential moment of letting go and just doing it.